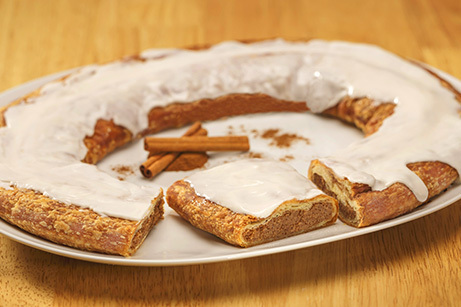 This Kringle will fill your kitchen with the aroma of cinnamon! 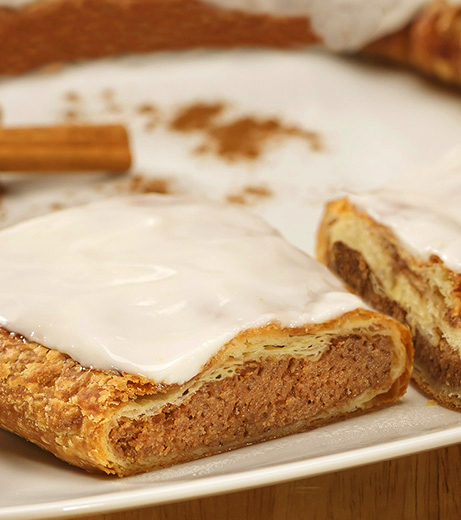 Our cinnamon Kringle has a buttery sweet cinnamon and sugar filling surrounded by our delicious golden brown pastry and then topped with sweet vanilla icing. Contains egg, milk, soy, wheat. May contain traces of tree nuts (almonds, macadamia nuts, pecans, walnuts, coconut) and peanuts due to processing on shared equipment. Cinnamon: Brown Sugar (Sugar, Molasses, Cane Syrups), Wheat Flour, Margarine (Interesterified Soybean Oil, Water, Salt, Mono- and Diglycerides, Annatto & Turmeric Color, Calcium Disodium EDTA preservative, Artificial Flavor. Vitamin A Palmitate), Sugar, Eggs, 2% Or Less of the Following: Cinnamon, Salt, Corn Syrup, Soy Lecithin, Soy Protein, Dextrose, Yeast, Natural & Artificial Flavors, Calcium Carbonate, Maltodextrin, Xanthan & Guar Gum, Preservatives (Sodium Benzoate, Tocopherols, Calcium Propionate), Agar-Agar, Malted Barley Flour, Corn Starch, Color Added.